In 1987, when Rob Mounsey and I agreed to make a "duo" recording together, we were not exactly certain just what our record was going to turn out to be. At that time, the technology of computers, and the relationship of the computer to making music was just beginning to explode. 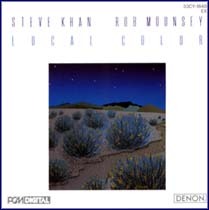 And so, today, "LOCAL COLOR"(Denon) stands out as a rather unique experiment in what was possible at that time. Of all the pieces of music we composed, I would have to say that, the ballads we each brought in were the most organic, and lent themselves perfectly for a duet performance. 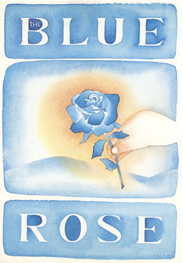 In that regard, "The Blue Rose" was my contribution and I remain very proud of this interesting little 'free ballad.' The 'live' recorded performance was augmented by Rob's brilliant and sensitive usage of his Midi-grand piano. So, a great portion of the orchestral feeling you hear was actually played in real time. My original lead sheet was just a single page, and no specific keyboard voicings were indicated because Rob and I speak a similar musical language, and I had complete faith in how he would interpret the bare chord symbol indications. However, for its debut here at Korner 2, I have presented some chordal voicing suggestions which, in part, mirror Rob's interpretation, or express how I would now voice things, after my intense Clare Fischer studies. As you can see, there is no time signature for the piece, and the only indication is that it is to be performed via "rubato." What this means is that, in addition to simply listening and feeling the music move along, Rob and I must have good sight lines in the studio because, at times, I had to 'nod' him into the next melodic fragment or unit. I used the squiggly lines, after the chord symbols, to indicate the sense of space. So, for example, when I could hear Rob taking a breath, I would sense that I could move ahead, and play the melodic pick-up into the next sonority. The piece really has no 'form' as we have come to know it, so I will simply discuss the composition in terms of each 'system' of music. On page  there would be four systems. Such as it exists, the 'form,' as it moved through the melody, was played four times. The 1st time, the melody is stated very simply by my steel-string Martin MC-28, and Rob offers commentary on the acoustic piano. The 2nd time through, in addition to restating the melody, the guitar now briefly improvises around it. From the pick-ups at the end of the 2nd system, through the 3rd system, these notes are played up the octave. This reoccurs when the melody is played for the 4th and final time. The 3rd time through, I decided to slightly change the harmonic color of the first chord, which had been a Dbmaj7(#5) to a more improvising-friendly sound, and this one time only Rob plays Gbm9(maj7)/Ab. Over this, one could play Gb melodic minor(Gb, Ab, Bbb, Cb, Db, Eb, F). On my cue, this one time only, we take the D.S. to the D/E chord, which one could view as Bm7(sus)/E. It is also during this chorus that we present our Frederick Delius(1862-1934) "moment"[from 2:41 to 2:51 on the recording] over the Emaj7(9#4) sonority. When discussing this beforehand with Rob, I made some open 4th voicing suggestions, and he applied them during the performance. Also true to Delius, the low E's from the acoustic piano are doubled by a timpani sample. I had become a great fan of this rather obscure British composer since Dave Liebman turned me on to his orchestral works when we were all just getting to know one another during the early '70s and belonged to a "music collective" known as: Free Life Communications. Delius composed many pastoral and impressionistically wandering orchestral pieces which reflect the beauties of the English countryside. Two of my favorite pieces are: "Upon hearing the first cuckoo in Spring" and "A Song before Sunrise." The 4th time through the form, Rob added some spatial percussion samples as effects while the melody is again stated by the guitar. When we again arrive at the Emaj7(9#4), there is a brief reprise of the low 'E' doubled by the timpani. This time, however, the guitar states the majestic open voicings. Finally, as we arrive at the end of the 4th system, we now take the coda for the [Tag] which only appears once for the ending. The ending uses the thematic melodic material which was played over the F7(9/13) sonority, and then passes through Amaj7(9#4) to Cmaj7(9/6), finally coming to rest on Bbmaj9/6. It gives the composition a lovely sense of finality, coming to rest on such a peaceful sonority. I think that it can be very instructive to try and compose a piece such as this, because you do not have be concerned with the rhythmic component, as there is no pulse, no tempo, no groove! So, you simply have to hear a melody, and follow it wherever it might lead you. You can harmonize as you go, or you could even wait until the melody seems to have 'written itself' and then add the harmonization. I really enjoy writing like this, and performing such things as well, because the mode of expression is so wide open. Don't be afraid, give it a try and see where your imagination takes you. Like many of my song titles from this period, "The Blue Rose" was inspired by a Jean-Michel Folon postcard I happened to purchase somewhere. And through the magic of the internet, we are able to share that very card with you on this page. Hopefully, it will, in some fashion, add to your appreciation of the music. As always, Blaine and I are wishing the best in 2005 for everyone who visits the site. In this age of the internet, it is amazing that, after nearly seven years, my webmaster and I have not even met personally yet!!! A confession of which I am not particularly proud.